The World Cup is only 37 days away, with the opening match between host nation Brazil and Croatia taking place in Sao Paulo on 12 June. Brassell: "Exactly how Italy coach Cesare Prandelli will arrange his attacking options ahead of the 14 June meeting with England has been a topic of debate for some time, but the last week has brought greater clarity to the Azzurri's plans. 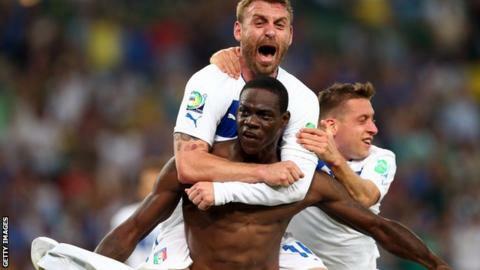 "Firstly, Prandelli gave an interview with Corriere della Sera in which he played down speculation over Mario Balotelli's place in the pecking order. Antonio Cassano had been mentioned as a possible replacement for the former Manchester City striker in the XI - with some fancifully suggesting Prandelli might leave out Balotelli altogether. Giuseppe Rossi was Serie A's top scorer, with 14 goals in 18 Serie A games for Fiorentina, when he was injured in January. "Giuseppe Rossi could be joining Balotelli, having made his long-awaited comeback from a knee injury for Fiorentina in Saturday's Coppa Italia final. The former Manchester United forward had been out since January after scoring 14 times in his 18 games earlier this season, and was last week described by Prandelli as 'an exceptional lad'. "One who looks unlikely to reprise past heroics is Luca Toni. With his 37th birthday approaching at the end of the month, Toni is on 19 goals for the season, two behind Torino's Ciro Immobile (who is almost certain to go to Brazil) and level with Juventus's Carlos Tevez. "Yet neither the Hellas Verona veteran nor Roma captain Francesco Totti figured in the 42-strong pre-tournament list released by Prandelli in mid-April. The coach added at the time that 'I have an immense respect for these players, but they won't be called up apart from in an emergency,' when pressed. 'We should just leave Prandelli in peace,' said Toni after last week's goal against Catania." Brassell: "One player who will definitely not be going to the World Cup is Porto midfielder Fernando. The 26-year-old was born in Brazil but has lived in Portugal since 2007, and applied to represent Paulo Bento's team at international level earlier this year after receiving a Portuguese passport. "On Friday, however, the Federacao Portuguesa de Futebol (FPF) announced that Fifa had rejected their request to enrol Fernando, as they 'considered that Fernando did not possess Portuguese nationality when he played for Brazil in qualifying for the 2007 Under-20 World Cup'. "The decision will disappoint Bento, who had hoped to include Fernando in his squad for the March friendly with Cameroon before red tape prevented it. Portugal seem unlikely to appeal, though there has been some bemusement that Diego Costa was allowed to switch to Spain, but Fernando has been prevented from joining the Seleccao das Quinas. "What is sure is that Fernando's absence will further strengthen the claims of Sporting Lisbon's William Carvalho for a starting place. The 22-year-old defensive midfielder, coveted by Manchester United and Real Madrid, made his debut in the dramatic play-off second leg against Sweden in November." A few eyebrows will likely have been raised over in Argentina as striker Sergio Aguero limped off with a groin injury in Manchester City's 3-2 win at Everton on Saturday. Aguero has struggled with recurring hamstring injuries this season, but he has played down this latest setback, writing on Twitter: "Thank you for your concern. I left just as a precaution. Fortunately I'm fine, happy for the goal, the win and keeping our dream alive." Despite his injuries, the 25-year-old has scored 28 goals in 33 appearances for City this season. Netherlands manager Louis van Gaal, a potential managerial target for Manchester United, has picked three uncapped players in a list of 20 home-based players for a World Cup training camp. Twente Enschede striker Luc Castaignos, Feyenoord defender Terence Kongolo and PSV Eindhoven striker Jurgen Locadia have been given the chance to make an impression in the three-day camp this week at Hoenderloo. Van Gaal is hoping to call upon foreign-based players for his second training camp, which starts on Sunday, after which he will name a preliminary selection of 30 players prior to the Netherlands' first warm-up friendly against Ecuador on 17 May. Manchester City striker Edin Dzeko and Stoke City goalkeeper Asmir Begovic have been named in Bosnia-Hercegovina's provisional 24-man squad for their maiden World Cup campaign this summer. Dzeko, 28, has scored 26 goals in 50 appearance for club and country this season while Begovic, 26, has been an ever-present for Stoke. Bosnia-Hercegovina will face Argentina, Iran and Nigeria in the group stage of this summer's tournament. "Our goal is to reach the last 16 and I think we are in with a fair chance because there is little or nothing between Nigeria, Iran and us," Bosnia-Hercegovina coach Safet Susic said. "Argentina are the odds-on favourites to win the group." Goalkeeper Johnny Herrera will be eligible to be selected in Chile's World Cup squad after being given a suspended sentence for drink driving instead of a jail term. The 32-year-old, who has four international caps, was given a 150-day suspended sentence, a fine and a two-year suspension from driving. According to Chile newspaper La Tercera, the prosecution had pressed for the Universidad de Chile player to receive a two-year jail sentence. Chile are in Group B at this summer's tournament along with reigning world champions Spain, Australia and the Netherlands. Australia midfielder Brett Holman has announced his retirement from international football, less than a fortnight before Socceroos coach Ange Postecoglou names his World Cup squad. Brett Holman has represented Australia on 63 occasions, scoring nine goals, since making his debut in 2006. The 30-year-old ex-Aston Villa man played a key role in helping Australia reach their third consecutive finals, but has now decided not to take part in Brazil this summer. Holman, now based in Dubai with UAE Pro League club Al Nasr, said he made the decision in order to spend more time with his young family and focus on his club career. "Over the past six months, circumstances have led me to rethink my international career and I have made the difficult decision to step aside from my role with the Socceroos," said Holman, who scored twice for his country at the 2010 World Cup.